It nests temptingly near cash registers, fits neatly in the palm of your hand, and incubates a satisfying embryo of goo. 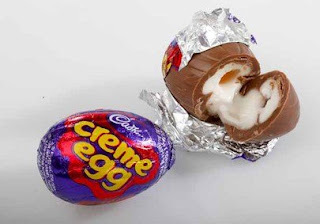 But, despite its dependability, there is still a shroud of mystery surrounding the Creme Egg: Just what is that filling? Why does it vanish after Easter? And is there a chocolate hen involved? You'll find the answers at Cadbury World in Bournville, England. More than just a tourist attraction, Cadbury World is a working chocolate factory. It's the only place in the world where Creme Eggs are manufactured, and they ain't measured by the dozen: 1 1/2 million eggs are laid every day. Unlike consumption, which is tailored to the period between New Year's Day and Easter, production goes year-round. "We keep them in a special refrigeration unit. They have to be kept at 5C," says Colin Pitt, education manager at Cadbury World. Some 300 million eggs are exported annually to North America. But, proving that elitists who swear by English sweets are not barking mad, Pitt admits that U.K. eggs are indeed different. "Our Creme eggs are sweeter and the chocolate is a different recipe," he says. The same goes for Dairy Milk, and all of Cadbury's milk chocolate products. "Dairy Milk in the U.K. uses full cream milk. America would use a powdered milk," he says. This is just one of the many factoids you learn as you drool your way through Cadbury World, which chronicles the history of chocolate through a series of elaborate multimedia displays. A theatre uses motion, heat lamps and blasts of air to liven up the story of founder John Cadbury and his empire. An interactive attraction invites visitors to chase a digital Creme Egg across a sensitized floor and splat it with a hefty jump, and there's a ride through a chocolate wonderland. Consoles that resemble arcade games offer the inside scoop on classics like Buttons, Fry's Turkish Delight and – oh, yes – Creme Eggs. The mini-documentary on the Creme Egg, which was introduced in 1923, reveals that chocolate is deposited into half-egg-shaped moulds. White fondant (a thick paste made of sugar and water) follows, and is topped up by yellow fondant. The two halves are joined, and a masterpiece is born. In England, the beloved Creme Egg appears in multiple incarnations: It has morphed into a chocolate bar, shrunken into miniature sizes and incorporated itself into McFlurries at McDonald's. You can even get stress balls and computer mice that resemble the treat. But Cadbury World isn't just one big sugar high. In fact, there is a meaty story behind the whole operation. It's the tale of a town built by chocolate. Bournville didn't exist until Richard and George Cadbury (sons of John) decided to move the business out of gritty, grimy Birmingham. In 1879, they transplanted the factory into the countryside and built social housing for their 16 "chocolate artisans." "As the business grew more successful, it gave George the opportunity to build a dream: modelling his own village," says Pitt. Devout Quakers, the Cadburys designed that village around their personal ethics: no pubs, no gambling and a commitment to health. Cadbury was one of the first companies in the U.K. to employ a company doctor and dentist (can't imagine why). Employees started the day with an exercise regime ("star jumps and such," says Pitt), and a recreation field, swimming pool and arboretum were constructed for the use of the Cadbury crew. The village was a bit lacking in history, so a 16th century house that was originally situated just down the road was moved into Bournville. Today, Bournville is a cute little enclave of cottages and parks boasting 25,000 residents. Ashley Pinnock is one of the few who still work at Cadbury. He attended Dame Elizabeth Cadbury school and says he always dreamed of ending up at the plant. "It was like Charlie and the Chocolate factory, you know?" says Pinnock, who demonstrates the art of chocolate making circa 1930 at Cadbury World. Britain's current Creme Egg ad campaign is entitled "how do you release the goo?" "We've identified that people eat Creme eggs in different ways," says Pitt. Pitt says women gently pull back the foil, nibble a bit and use their pinky finger as a utensil, while men tend to just pop the whole thing into their mouths. Others wield a spoon. As for the time-limited release, that's calculated to build excitement and anticipation. "It's called `the strawberry syndrome,' where people look forward to certain times of the year," explains Pitt. In other words, if you want to sink your teeth into an egg this year, you'd better scramble.